Marvel has been going back to basics with its X-Men line as part of its “ResurrXion” event. The problem with that approach is that it’s basic. Most of these series are an improvement on the last year and a half of X-Men comics, but there’s a staleness that permeates much of the line. Marvel tried something different by pitting the X-Men against the Inhumans, which didn’t resonate with readers, however, because it lost sight of the things that make the X-Men a fun, engaging property. The publisher is trying to recapture the old magic, and the main titles, X-Men: Gold and X-Men: Blue, are throwbacks that retread familiar plot points with slight variations. There’s a section of the X-Men fan base that doesn’t mind this if the stories are true to the characters, but when so much of the superhero genre is built on regurgitating the same concepts over and over again, it’s hard to be thrilled about books that aren’t delivering anything new. Generation X shares a name with the ’90s series spotlighting a new class of teenage mutants that trained away from the main X-Men base of Xavier’s School For Gifted Youngsters. The new series takes place at the newly opened Xavier Institute For Mutant Education And Outreach, located in the heart of Central Park, with Kitty Pryde as its headmistress, but the concept of the series is different from the X-Men norm. The first issue was a fairly traditional introduction to the new campus and its students following new addition Nathaniel Carver, a psychic mutant with the ability to enter a person’s mind and experience a third-person view of their memories. The second chapter was when the book started to break from convention. Writer Christina Strain’s concept for this series has former mallrat/current vampire-mom Jubilee as the teacher of a class of mutants that aren’t being groomed to be X-Men or mutant ambassadors. These students are getting “real-world practical application training,” which means they’ll be learning how to use their powers so that they can become productive members of society when they finish their time at the Xavier Institute. This direction emphasizes that this superhero base is still a school, and one of the best things about the series is that the institute actually feels like a campus. It’s the little things that create that atmosphere: Roxy “Bling!” Washington jogging around a track and stopping so she can ask a teacher if she can switch over to his class; Benjamin “Morph” Deeds and Megan “Pixie” Gwynn playing video games while Quentin “Kid Omega” Quire watches with boredom before sabotaging Pixie’s controller with his telekinetic powers. These characters have code names, but it feels weird to use them when the story is actively about them not being on a superhero track. Of course, this is still a superhero comic, so the cast is going to be doing superhero things, but this week’s issue focuses on defining the characters and establishing the group dynamic. Strain’s big claim to fame was as the colorist on Runaways (along with a number of other Marvel series), and you can definitely see the Runaways influence on how she writes teen characters and their interactions with each other and authority figures. Generation X #3 goes a long way to establishing this class as a team, especially in the final moments when the students decide to break curfew and venture out on their own to stop a mysterious threat. As the rest of the X-line focuses on the most popular mutants, Generation X is working to flesh out newer characters that haven’t gotten as much attention, and it’s nice to have a title looking to the future of the franchise rather than trying to get back to the past. Strain is the only woman writing a ResurrXion title (including Inhumans books) and one of the few women of color given the opportunity to write an ongoing superhero comic. Strain’s point of view as an Asian woman informs the opening scene of this week’s issue, which features Lin “Nature Girl” Li talking to a seal about the attack on the school in the first two issues. Lin’s previous appearances in X-Men comics perpetuated a Quiet Asian stereotype, and Strain directly addresses this when Trevor “Eye-Boy” Hawkins teases Lin about finally hearing her talk. “For future ref, Trev, never assume an Asian girl’s mute,” Nathaniel tells his schoolmate. It’s a funny moment that also comments on how Lin has been depicted in the past. She has a more aggressive role in this issue, and she’s also set up as a potential love interest for Trevor. All it takes to accomplish this is a single panel of Lin flipping her hair with a “whoosh” sound effect, that single image adding a new layer to her relationship with her fellow mutant. The X-Men mythos is filled with compelling characters, and Strain is making excellent use of the full breadth of the mutant population. Jubilee’s old Generation X colleague Chamber is a recurring character, and this week’s issue also features an appearance from Dani Moonstar, the beloved New Mutant who lost her mutant powers, but currently has superhuman abilities because she’s an Asgardian Valkyrie (superhero comics are so weird). One of the most surprising additions to the cast is Andre Wexer, a character whose previous appearance was a single one-shot, Wolverine: Saudade, originally published by Marvel Europa and in English in 2008 (currently available on Marvel Unlimited). 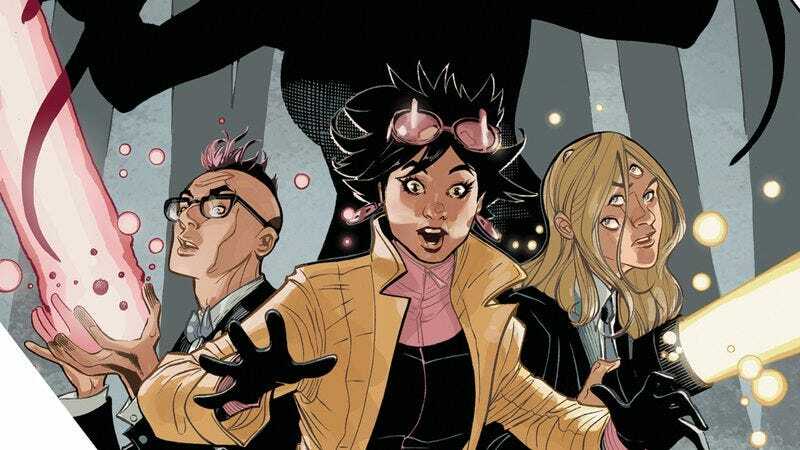 The range of characters in Generation X shows the depth of Strain’s knowledge of the rich history of the X-Men, and given the surprising characters that have shown up thus far, it will be exciting to see who else appears down the line. Amilcar Pinna has worked on teen superheroes in the past with his run on All-New Ultimates, and his work has significantly improved in the years since that series ended. He has a strong handle on body language and facial expressions, but there’s still some awkwardness with characters’ mouths, which occasionally look too big for their faces. Pinna’s control of emotions is highlighted during the scene where Nathaniel uses his powers on Face, a fellow mutant that is attacked in Central Park. Close-up shots of Nathaniel run across the side of the page as he experiences flashes of Face’s memories. Pinna breaks down Nathaniel’s anger, pain, and shock in clear detail as he learns more about Face’s tragic past and his recent attack. When Nathaniel uses his powers, the straight black panel borders are replaced by jagged edges to add an extra element of visual tension, but when he goes in to hug Face after experiencing his trauma, the border disappears completely to create a sense of calm and openness. Superhero comics could use more hugs, and this tender moment reinforces Nathaniel’s empathetic spirit. Pinna and colorist Felipe Sobreiro are assisted by inker Roberto Poggi and colorist Nolan Woodard in this issue. It’s not entirely clear which pages each worked on, but that’s a good thing. Poggi’s inking is so similar to Pinna’s that it’s difficult to spot where it changes, and the only reason I recognize where Woodard takes over is because I know his style and was looking for it. Casual readers probably won’t recognize the transition, which is the best case when having multiple artists on a single issue. Sobreiro and Woodard both do great work amplifying the texture in the linework, and their palettes add energy to an issue that is light on action, but heavy on personal moments that bring the cast closer together. This creative team has the potential to make something really special, and hopefully Marvel will give Generation X the opportunity to grow and grab readers who are looking for character-driven stories spotlighting the future of mutantkind.